Welcome to Mercy Ebute's Blog: Lagos at 50: Gov. Ambode sets up planning committee, makes Prof. Wole Soyinka and Gbadamosi Co-Chairmen. Lagos at 50: Gov. 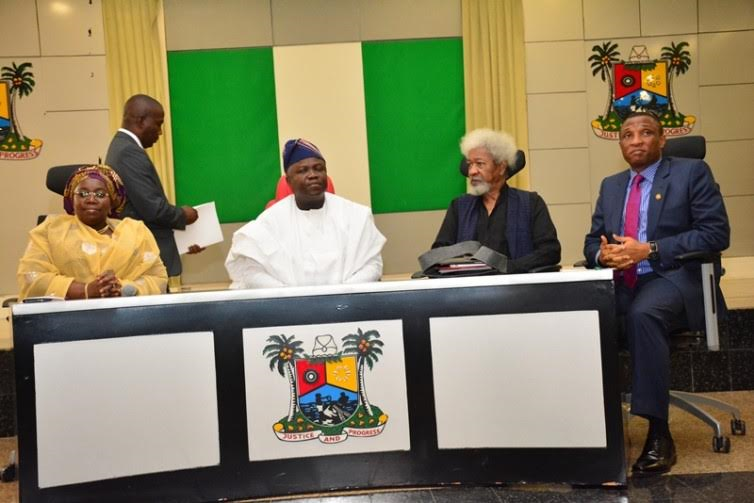 Ambode sets up planning committee, makes Prof. Wole Soyinka and Gbadamosi Co-Chairmen. 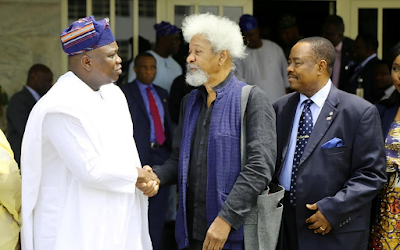 Lagos State Governor, Mr. Akinwunmi Ambode on Wednesday, February 10, appointed Nobel Laureate, Professor Wole Soyinka and Mr. Rasheed Gbadamosi as Co-Chairmen of the Lagos at 50 Planning Committee, just as he expressed optimism that the celebration will go a long way to showcase Lagos in its full splendor. The Committee also has 10 others as members, including Hon. Habeeb Fasinro, Chief Olawale Cole, Mrs. Sarah Boulos, Mr. Abimbola Obafunwa, Prof (Mrs) Senapon Bakare, Mrs. Chika Balogun, Mr. Folarin Coker, Prof. Ademola Abass, Bolanle Austen Peter and Mrs Olufunmilayo Balogun as Secretary. 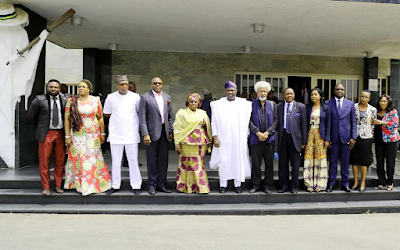 Governor Ambode, while inaugurating the Committee at the Lagos House, Ikeja, expressed confidence in their ability to deliver a world class celebration, adding that the opportunity of Lagos at 50, will afford the state to not only celebrate its past achievements, but also to showcase to the world its immense potentials for future growth and development. "Lagos State will be 50 years next year. 50 years is a significant landmark in the life of any individual, institution or State. For Lagos State, it has been an eventful 50 years which deserves to be fittingly celebrated," he said. 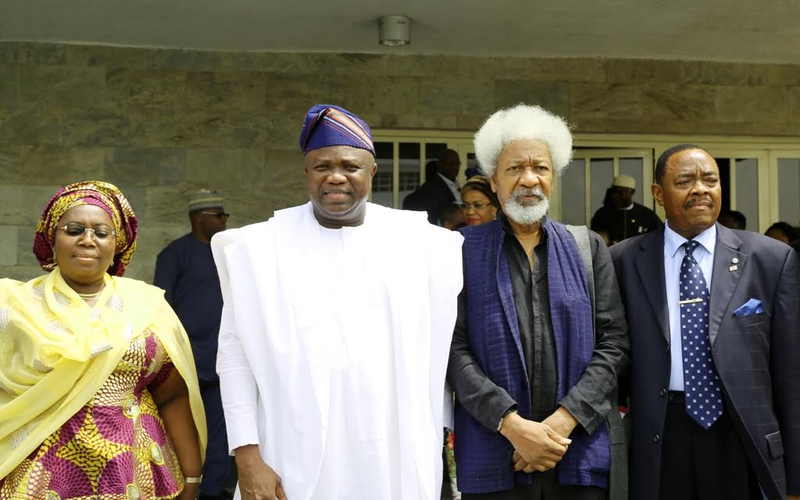 He said Lagos, despite being the smallest and oldest state in Nigeria, remains the only state that has not been divided to create more states since its inception on May 27, 1967. The Governor said that Lagos has maintained its status as the commercial capital of Nigeria and the most cosmopolitan State in the country where peoples of every tribe, race and creed reside peacefully with an excellent record of religious tolerance. "Lagos is a land of opportunities, offering all residents the chance to succeed in their vocations and endeavours. Lagos provides jobs to more people than any other State in Sub Saharan Africa. Lagos is that place where you have a chance to make it if you work hard." Indeed, Lagos State has justified its creation. Apart from being the pacesetter and first among equals in the comity of States in the Nigerian Federation, Lagos State also occupies a noticeable position in global affairs especially as the fastest growing mega city in the world. "With all these in mind, it is imperative that we celebrate Lagos at 50. In celebrating Lagos, we must showcase our cultural heritage. We must celebrate the language, arts, sights and sounds of Lagos. Celebrating Lagos is to celebrate Nigerian Unity and Progress because Lagos provides the cohesion that keeps Nigeria together", he said. He said a celebration of such great significance requires proper and adequate planning, hence the inauguration of the Committee comprising respected men and women whom he said had perfect understanding of the expectations of Lagosians, Nigerians and indeed the entire world. 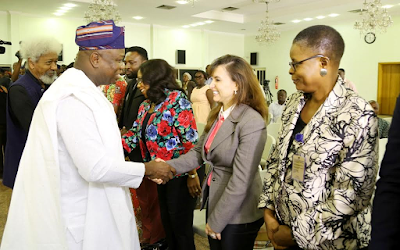 The Governor further said with the distinguished men and women that formed the Committee, he was rest assured that Lagos would be excellently celebrated and the world would see Lagos in its full splendour. The terms of reference of the Committee , according to Governor Ambode, include to develop a comprehensive programme for the celebrations; identify series of events that will take place as part of the celebrations; establish the logistics requirements to ensure a hitch free celebration; identify areas of possible collaboration with corporate organizations and individuals for support; as well as consider and make appropriate recommendations on any other matter that will ensure a successful and memorable celebration. In his short remarks, Professor Soyinka said the celebration of Lagos at 50 would afford an excellent opportunity for the state to identify with the triumph, losses and experience of the Black Race at home and in the diaspora. He pledged that members of the Committee would work assiduously to ensure that Lagos gets the deserved and most befitting celebration. While acknowledging the achievements of the state so far, Professor Soyinka likened the celebration to one of the programmes in past editions of Lagos Black Heritage Festival called the ‘Black in the Mediterranean Blue’, saying “It would be used to project the black race not just for the colonial experience and slave trade, but also as a cultural people.